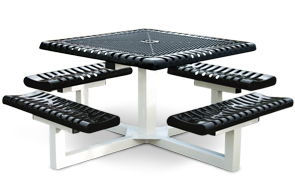 Combining the durable strength of pedestal legs with the convenient quality of portable picnic tables, these 46" thermoplastic coated square picnic tables are perfect for any outdoor recreational area. 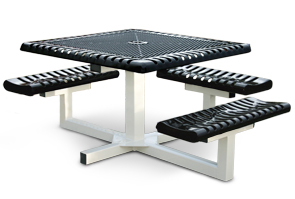 The expanded steel tops and ribbed steel seats allow for rain water to pass through, avoiding water build-up and preventing rust from forming. 3/4" # 9 Gauge Expanded Steel Top. 2" Radius Rolled Ribbed Steel Edge. # 11 Gauge Ribbed Steel Seats. 4" Square Galvanized Steel Frame. 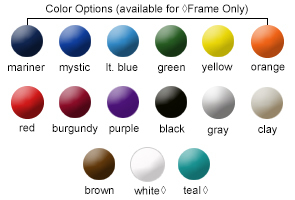 Optional 7-1/2" and 8-1/2" umbrellas are available in any of the color options shown below, in either a single solid color or a 2-color alternating pattern.